Nashville, TN – Brad Bagwell and Melvin McLerran have been selected as the Tennessee Wildlife Resources Agency 2016 Boating Officer of the Year and part-time Boating Officer of the Year, respectively. Both officers are assigned to work District 21, a 12-county district in Middle Tennessee. 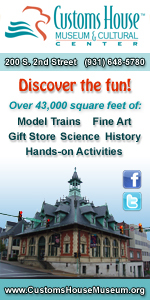 District 21 contains the five major reservoirs of J. Percy Priest, Cordell Hull, Old Hickory, Cheatham, and Barkley. Brad Bagwell holds his award for being named the Boating Officer of the Year. Pictured (from left) are Lt. Jim Hooper, Col. Rider, Director Carter, Officer Bagwell, Lt. Col Moates, Chairman Cannon, and Cpt. Grandstaff. Morristown, TN – The Tennessee Fish and Wildlife Commission approved the 2015-16 late waterfowl hunting seasons and was presented the 2016-17 state’s fishing regulations proposals at its August meeting on Friday. In addition, the participants in Tennessee’s 2015 elk hunt were announced. Nashville, TN – The 2014-15 state waterfowl hunting seasons and a preview of next year’s sport and commercial fishing proclamations will be among the agenda items for the Tennessee Fish and Wildlife Commission at its August meeting. 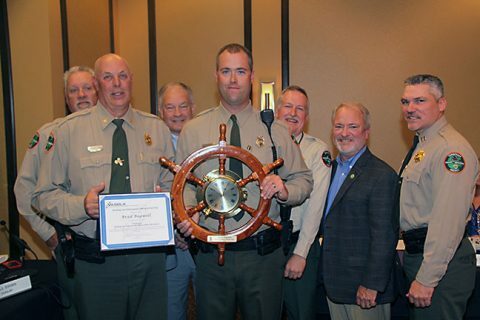 Nashville, TN – Nick Luper has been named the Tennessee Wildlife Resources Agency 2012 Boating Officer of the Year while Tommy Stockling is honored as Part-Time Boating Officer of the Year. The recipients of the annual awards were announced by Darren Rider, TWRA Boating and Law Enforcement Division Chief. Both officers serve in TWRA District 31, which encompasses 12 counties in northern Middle Tennessee and has popular boating and fishing destinations. 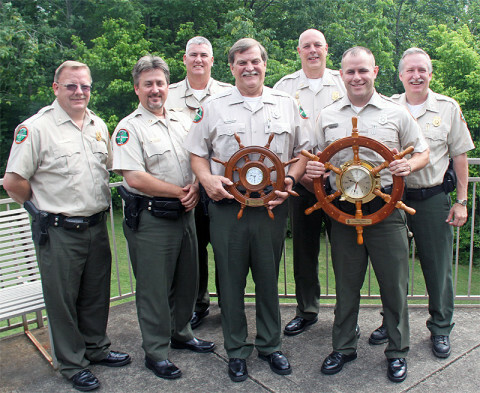 The officers were presented their awards at the May meeting of the Tennessee Fish and Wildlife Commission. Tommy Stockling (left) and Nick Luper are with their respective awards after being introduced as the Tennessee Wildlife Resources Agency part-time Boating Officer and Boating Officer of the Year for 2012. Also pictured are (from left) District 31 Lt. Tim Singleton, District 31 Cpt. Roy Cannon, Region III Maj. CJ Jaynes, Boating and Law Enforcement Division Chief Darren Rider, and Asst. Boating and Law Enforcement Chief Glenn Moates.